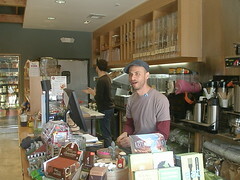 Have you checked out locali on Franklin Ave. in Hollywood? I only recently found out about this store and had to visit. Reading on the website, it read like a green 7 – 11. Funny thing, that’s exactly what it is and then some. Want a slushie? They have yummy ginger tonic slushies in a couple of flavors. There are vegan and vegetarian burritos available along with salads, soups and other ready-to-eat items. Fresh organic coffee is for sale and quite delicious.